In medical school, I was told medicine is an art and not just a science. In residency, I learned that the art is inexact and that uncertainty is part of life for physicians. One patient who taught me deeply about the latter was a young woman who had come to see me for her annual check-up. She was a regular clinic patient with excellent insight into her health—one who often helped people in her church navigate their complicated medical issues, and one I saw for social visits as much as medical. She would always minimize her health literacy, saying, “I’m just a high school grad,” but I always told her she had good instincts and that I trusted her judgment, too. As physicians, it is important to have a collaborative approach on health care decisions, and I always felt this way with my patient. During her appointment, we discussed whether she needed a mammogram that year. She did not have any risk factors that would require her to get an annual mammogram, so I told her it was not entirely necessary that she get one that year, but we could discuss risks and benefits and make a decision together. Using the collaborative approach, we decided to order the mammogram. After our patient visits, we often wonder whether we did right by our patients. In this case, I was upset I could not give the patient an absolute "yes" or "no" to the mammogram questions. But in speaking to my mentors in clinic, I realized that this is a feeling that all physicians have and that collaboration was important. Still, in these moments of certainty, it is helpful to lean on evidence. I ordered the mammogram for the patient, and after doing so, I began looking into studies to determine if what I had done was right or wrong. A 2014 ACP Journal Club summary noted that among women aged 40 to 59 years, “annual screening with mammography for 5 years does not reduce long-term risk for breast cancer mortality more than usual care or annual screening without mammography" (1). So we may diagnose the cancer, but ultimately it may not affect mortality. Reading this made me feel a little better, knowing that mortality may not be affected by annual mammograms. A more recent article in Annals of Internal Medicine helps address the screening question further (2). As the authors noted, “annual screening has a favorable balance of benefits and harms and would be considered cost-effective for subgroups of women aged 50 years with risk levels that are 2 to 4 times the average and that have heterogeneously or extremely dense breasts.” I now have justification in one scenario in which annual mammograms are needed. On the basis of this study, in women with low risk and nondense breast tissue, mammograms could even be spaced out to triennially. I find it helpful to have these facts behind me in ordering or not ordering mammogram testing. Knowing them now, I think I would have still recommended the mammogram because she does have a history of dense breast tissue. 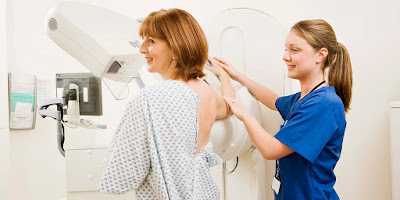 Knowing that the patient ended up having cancer, I went back to my clinic preceptors and asked them whether, given that the patient ended up having cancer and knowing the information presented in Annals, they were going to recommend women get annual mammograms. It was clear this was a difficult question to answer, given the situation with my patient. Most of my mentors said they still would use evidence and a collaborative approach with the patient. They do not feel compelled to order a test based on the experience of one patient alone. I have since asked myself the same question, and while I carry my experience with my patients with me, I do not have an explicit "yes" or "no" when it comes to mammograms. It remains a discussion. I explain that annual mammograms in low-risk cases do not always have mortality benefits. However, I gauge the situation with my patients, and ultimately, I think we discuss together what the best decision is. The conversation between patient and physician is perhaps the epitome of the art of medicine. Since beginning the clinical practice of medicine, I have realized that nothing is certain, collaboration is a good approach, and guidelines are helpful but situational. When it comes to breast cancer screening with mammography, it is a conversation. Great post. This shows us that medicine is an art and cannot be reduced to cold hard guidelines imposed on physicians.
" Since beginning the clinical practice of medicine, I have realized that nothing is certain, collaboration is a good approach, and guidelines are helpful but situational." Your words, not mine, and I endorse them. I like science, but like common sense more. Because our understanding of diseases is limited by what science has uncovered about them and our own experiences treating people, we must perforce, balance wisdom, art, and science in treating patients and should try to include them in making decisions about their health; the last has the additional bonus of enhancing compliance by patients with the recommendations they receive. I also think that in tough situations it helps to ask the question, "If it were me or a relative, what would I do?" The answer to that question is frequently informative. The fact that this woman had cancer doesn't mean it was right, as this doctor concluded, to order the mammogram. That argument would justify doing mammograms and psa's on everybody.There is a 20-30% chance of overdiagnosis with a finding of invasive cancer. And the study cited by the doctor says there is no survival benefit for this woman. And did the doctor's quote that “annual screening has a favorable balance of benefits and harms and would be considered cost-effective for subgroups of women aged 50 years with risk levels that are 2 to 4 times the average AND that have heterogeneously or extremely dense breasts,” is ambiguous. Is it AND or OR? If it is AND, do we know from this summary that the woman's risk factors were in fact increased? Finally, I think this doctor gives lip service to a collaborative approach but in fact pushed the woman to have the mammogram. I think the patient's response that it was 'a tough year' (the best comment in the whole essay) may have indicated she still wasn't sure she had done the right thing, unlike the man who, 10 years after a prostate cancer diagnosis based on psa screening is convinced the psa saved his life. "I find it helpful to have these facts behind me in ordering or not ordering mammogram testing. Knowing them now, I think I would have still recommended the mammogram because she does have a history of dense breast tissue"
Annual, biennial, or triennial digital mammography screening from ages 50 to 74 years (vs. no screening) and ages 65 to 74 years (vs. biennial digital mammography from ages 50 to 64 years). Lifetime breast cancer deaths, life expectancy and quality-adjusted life-years (QALYs), false-positive mammograms, benign biopsy results, overdiagnosis, cost-effectiveness, and ratio of false-positive results to breast cancer deaths averted. Screening benefits and overdiagnosis increase with breast density and RR. False-positive mammograms and benign results on biopsy decrease with increasing risk. Among women with fatty breasts or scattered fibroglandular density and an RR of 1.0 or 1.3, breast cancer deaths averted were similar for triennial versus biennial screening for both age groups (50 to 74 years, median of 3.4 to 5.1 vs. 4.1 to 6.5 deaths averted; 65 to 74 years, median of 1.5 to 2.1 vs. 1.8 to 2.6 deaths averted). Breast cancer deaths averted increased with annual versus biennial screening for women aged 50 to 74 years at all levels of breast density and an RR of 4.0, and those aged 65 to 74 years with heterogeneously or extremely dense breasts and an RR of 4.0. However, harms were almost 2-fold higher. Triennial screening for the average-risk subgroup and annual screening for the highest-risk subgroup cost less than $100 000 per QALY gained. Models did not consider women younger than 50 years, those with an RR less than 1, or other imaging methods. Average-risk women with low breast density undergoing triennial screening and higher-risk women with high breast density receiving annual screening will maintain a similar or better balance of benefits and harms than average-risk women receiving biennial screening." Unfortunately, our default is to rationalize reasons to push the screening test, while we now give lip service to "collaborative reasoning". If this were overdiagnosis, she has certainly not done this woman a favor. If it is not overdiagnosis, is her life improved by this discovery? At least the doctor's is as she doesn't have to deal with the legal and emotional jeopardy in a delayed diagnosis of an "aggressive" cancer, regardless of whether the time of diagnosis affects survival. As a Integrative-Biological Dentist, I can only give you my clinical observations of 30 years of private practice. I have seen patients results of mammograms and THERMOGRAMS and I am confused why any woman would have a mammogram done when a THERMOGRAM is physically safer. No radiation into a soft tissue structure and is only as good as the radiologist interrupting the result. A thermogram is so easy to interpret because a hot spot will show up in red, yellow and healthy ares in blue. Why would a patient, who I will never do a physical examination, come to me with their results? I have a degree as a Doctor of Integrative Medicine. I evaluate their 3D Cone Beam panoramic x-ray or CBCT (cone beam computerized technology) of the patient's upper and lower jaws. I am looking for past extractions sites, root canal treated teeth, metal restorations, periodontal health of the patient and much more. I believe cancer and so many of the degenerative diseases we see today originate from sites of inflammation. As a Integrative-Biological dentist, I have patients who seek out my services because their dentists sees everything as 'common' but it might not be normal or healthy. If the patient has radical surgery, chemotherapy and radiation of their breasts, does she have a better outcome than one who does nothing? What are the emotional consequences of the disfigurement of their body have on them for the rest of their lives? What is the longevity and quality of their lives? Have the conditions that may have caused this awful situation been addressed and removed from the patient's body? From a patient's panoramic x-ray, I can ask the patient many questions about their health. Which teeth are most likely to be involved if a woman has breast cancer or ovarian cancer. What dental procedures that are performed everyday in dental office around the world can influence the health of a woman or a man later in their lives? How many physicians for that matter dentists have this knowledge to even look for the possibility that a 'poorly' performed extraction, root canal treated tooth, metal based restorations and unattended periodontal disease could be the beginning of a degenerative disease which could badly impact the health of your patients? I have been part of a medical-dental team treating patients with early stages of breast cancer. The sooner the treatment the better the results. A Thermogram can detect a change as small as an eight of an inch. If you have the freedom of doing a thermogram, try it. You can even compare the results to that of a mammogram. The breast you image could belong to a patient who you may be able to save their life and breast; if you are early enough. In my experience, many clinicians do not mention the potential harm of over diagnosis in breast cancer screening. Several lines of good evidence indicate that there was a 1 in 3 chance that the invasive cancer would never have become clinically apparent in the absence of screening; the number is closer to 1 in 2 if DCIS is added to the equation. In retrospect, it is not possible to know which screen detected cancers are over diagnosed. I wonder if the collaborative discussion mentioned over diagnosis?